Purdue Arboretum – Let’s Grow Native! At Purdue, we pride ourselves on our planting and preservation of native plant species throughout our campus. We understand the major role they play in our ecosystem and how their disappearance would cause significant problems not only for the landscape but the people living in it. Yet, while Purdue is working hard to keep native plant species present on campus, many landscapes across the country are struggling. Many ecosystems are at risk from increased fragmentation and a subsequent influx of invasive species, which can displace some native plant species. There are serious consequences when native species are removed from an area. This reduces biodiversity and leaves the area especially susceptible to the encroachment of invasive species. This can further reduce the number of natives, turning a once thriving ecosystem into a sterile wasteland. But, with knowledge of the situation and careful consideration to planting practices, hope is not lost. Native plant species offer a multitude of benefits. One of their most important contributions to biodiversity is that they provide food for herbivorous insects, typically caterpillars, which in turn support entire food webs. Most herbivorous insects are specialists, meaning they can only eat a small subset of plants. Since native insects and plants have co-evolved for centuries, insects have adapted their diets accordingly. They are highly specialized to eat a subset of the plants they have evolved with, otherwise known as host plants. When there is high diversity of native plants there will be high diversity of insects and caterpillars. 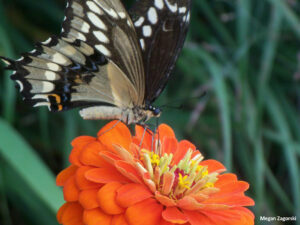 When insects and caterpillars are plentiful in an ecosystem the rest of the ecosystem has a plentiful source of food. Biodiversity in the landscape is essential to ensure the smooth operation of the ecosystem. This relationship can be compared to the rivets on an airplane in the analogy created by American biologists, Paul and Anne Ehrlich. In this analogy, the rivets are holding the airplane together allowing it to fly through the air. The rivets symbolize species in an ecosystem. If a few species are lost the ecosystem will still run but if enough are lost the whole ecosystem will come crashing down. Native plants are relatively maintenance-free. When they are in their natural habitat and are planted in the correct location, native plants flourish because they are adapted to the local climate. They require little to no fertilizer and typically do not need any extra watering to survive. As a result, native plants are typically easier to take care of and often less expensive to establish in the landscape than non-natives species. Many people avoid native plantings because they sometimes appear messy and overgrown, however native plants can be just as beautiful and interesting as non-natives. When the right plants are chosen to fit a particular location and function, landscapes will be beautiful and will flourish. Invasive plant species are any plants that are not native to the landscape and often reproduce and spread rapidly. Invasives are typically introduced into the landscape through unsuspecting landowners. On the surface these plants can seem like great options for landscapes with characteristics such as ‘better hardiness’ or ‘beautiful blooms’ but in reality, these plants are can be more of a problem than they’re worth. Once invasives find their home in a non-native environment they compete with the native species for sunlight, water, nutrients, and space. Because of the invasives fast-growing, aggressive nature and the lack of their natural predators in the foreign environment they have the advantage over the natives. One example is the Callery Pear, Pyrus calleryana. 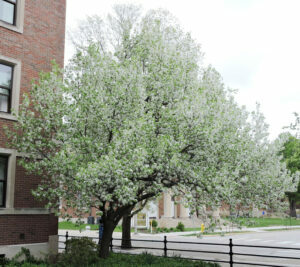 The Callery Pear is a small ornamental tree native to China. It’s prized for being pollution tolerant, disease resistant, and having beautiful flowers in the spring. Because of the abundant fruits found on the tree and its fast-growing nature, it was not difficult for the tree to spread rapidly. Today, the Callery Pear can be seen all over the Midwest and densely packs many forests in Indiana. The Callery Pear is not only displacing the native plant species, but it’s also slowly starving entire food webs. Since insects are highly adapted to eat native plants, most are unable to eat nonnative plants and their populations suffer, impacting the entire food web.